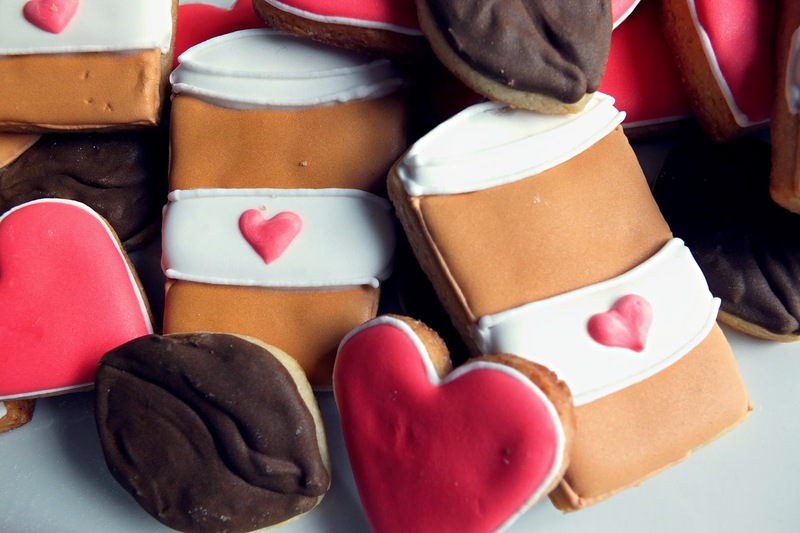 Cookies, Cakes and Condiments: Cookie Theme - Coffee with Love! This week, I used some inspiration AGAIN from sweetsugarbelle.com, as she is so thorough, and the finishing touches on her cookies are absolutely awesome. One day people, one day! I actually don't own a coffee cup cutter, so used a baby onesie cutter, and chopped the sleeves and bottom bit off. Inverted, it gave a great angled look to my cookie. I did cut in the round on the top by hand, just to give a better definition of the lid once completed, and I must say I am glad I did. Above, you can see where I have used a food-safe marker to draw out where I wanted to run each section. This is really useful when you are going to be using multiple colours. You can also see above the coffee bean cookies, which I hand cut as I just had nothing that I could see that would work. Note to self to stop taking photos on our wooden table. Will move to a white background for better colour I promise. On the right you can see where I lined the coffee cup sections, using a tan colour I made using mint green, lemon yellow and super red. Next, I flooded the tan sections of the coffee cup in. At this point, I let them set for about an hour, so the colours wouldn't run when I added the white mid-section and top. I just used a straight white for these ones, but in hindsight I would have tracked down some Ivory colour to add to the royal icing, just to offset quite how white this icing is. There is really only one shop in our city that sells the Americolor brand gel colours and they carry a limited supply, so everything is ordered online. It just means I have to think ahead and stay on top of colours, which obviously didn't happen this week. I piped around the top edge and sides before flooding in the white. For the coffee beans above, I used a thicker icing in favour of not lining and then flooding, simply filling one half of the cookie, waiting for it to semi-dry, then filling in the remainder, as you can see here. Added in some lovely hearts, lined with white, filled with a icing which was a mix of electric pink & super red. These found their way to someone who totally deserved some coffee cookies. Check in later this week for this weeks theme. ORIGAMI!